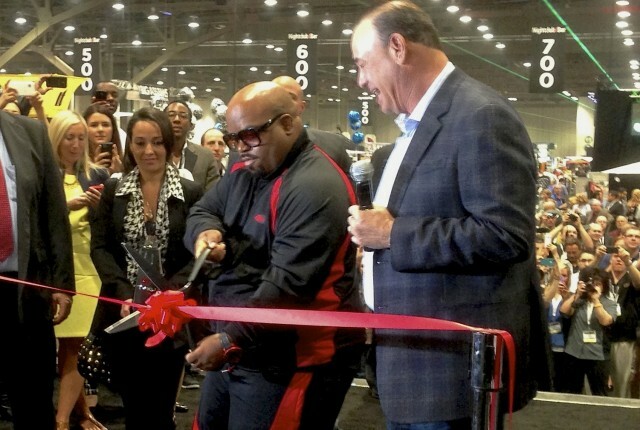 Even though it was celebrity Cee Lo Green who cut the red ribbon (and promoted his Ty Ku Sake in the process), the 2013 Nightclub & Bar Show had a little less glitz and a lot less glam than years past. Missing from the show floor were the monster energy drink booths and flashy star-backed spirits. The vibe at Nightclub & Bar was all about business, with lots of smaller companies with good ideas trying to find a place in the vast nightclub and bar market. Lovoka, a caramel vodka-based liqueur from South Africa, is actually a true caramel liqueur, embracing everything that caramel flavor has to offer. While Lovoka is sweet, it delivers its caramel flavor superbly with a solid finish and a pleasant amount of caramel flavor lingering on the palate. It’s sweet and rich enough to represent true caramel but balanced enough to really be enjoyable. We’ve seen some velocity with the carbonated, ready to drink vodka-eque cocktail like Air (Alcohol Inspired Refresher). To date many of these cocktails in a can have looked to malt for their alcohol power. Lavish “Sensual” Vodka Cocktail uses Russian vodka in a drink that, tasted blind, would easily be mistaken for a vodka Red Bull. 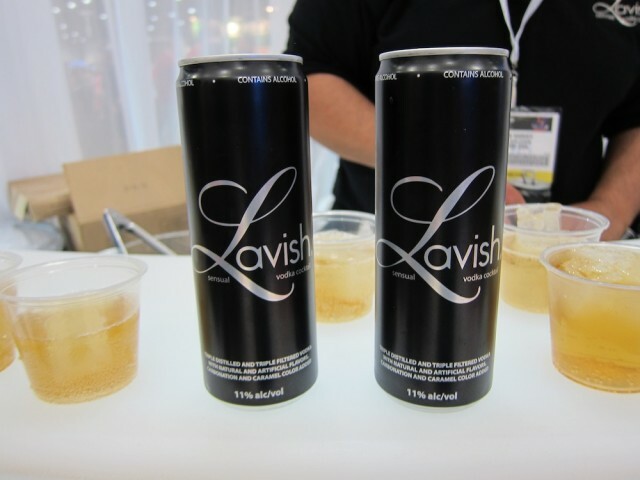 While Lavish might taste like an energy drink, it has no caffeine or energy properties in it. It’s a savvy move as many have become accustomed to the taste combination of vodka and Red Bull, but may not want the energy punch that comes with it. Lavish is 11% alcohol and sells for around $3 a can. With flavored vodkas now representing over a million cases of spirits sold in the US, there were a fair amount of flavored offerings at the Nightclub & Bar Show. One of the best of this bunch was Zing Red Velvet Cake Vodka. Zing is a product from the wildly successful Maloof family, owners of the Palms Hotel and Casino and the Sacramento Kings. Like some of the better flavored vodkas, Zing is true to its flavor and tastes a lot like red velvet cake with solid chocolate, vanilla, and cherry notes. We’re often skeptical of spirits in light up bottles, but Zing managed to impress. Zing Zang Bloody Mary Mix: Zing Zang has been around for seventeen years and is one of the best selling Bloody Mary mixes in the US, but that didn’t stop them from continuing to make a push at the 2013 Nightclub & Bar Show. In a market of increasingly spicy Bloody Mary mixes, Zing Zang focuses on delivering good flavor with balanced spice and quality ingredients. 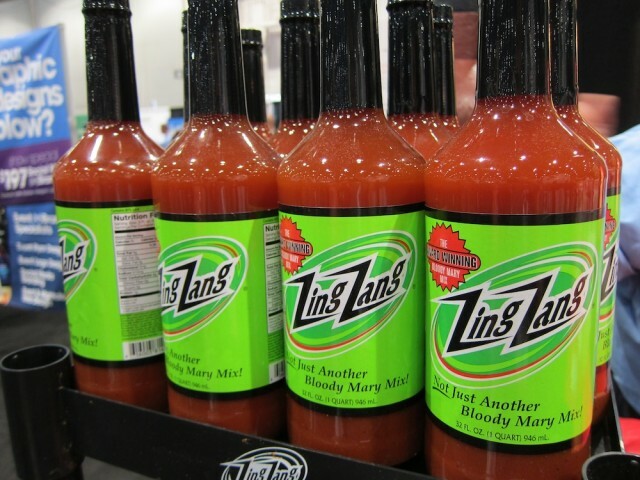 Zing Zang stands out from the pack by using Lea & Perrins Worcestershire Sauce, no added salt, and myriad of spices to create a fantastic mix. While Zing Zang is a very classic Bloody Mary mix, Ubons BBQ Bloody Mary Mix is something quite different, with flavors inspired by Memphis barbeque. In addition to some of the classic Bloody Mary flavors, Ubons brings to the mix garlic, onion flake, celery seed, cayenne, and flavors of sweet Memphis barbeque (“a Memphis flair with a nod to Kansas City”). As with good Memphis barbeque sauce, Ubons starts out rich and sweet and then moves to a nice cayenne spice with a variety of flavors that work well with vodka. 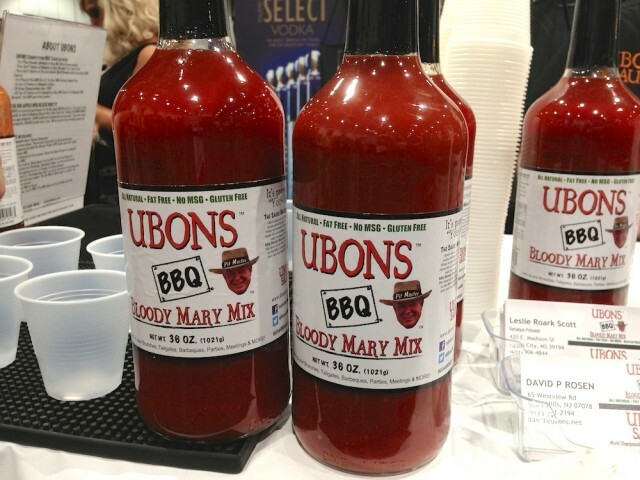 Ubons is a fantastic option when you’re looking for something a little different for your Bloody Mary. 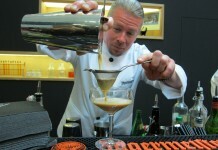 One of the most difficult elements to work with behind a bar is coffee. If a customer orders an Irish Coffee and there’s no fresh coffee brewed, this otherwise simple drink can turn into a nightmare. Coffee is also fairly perishable, and so even if you ice it, it doesn’t have much of a shelf life. Enter Java Juice, a unique new espresso concentrate which makes working with coffee flavors a snap. Java Juice is ten times stronger than a single cup of coffee and two times as strong as a good double shot of espresso. 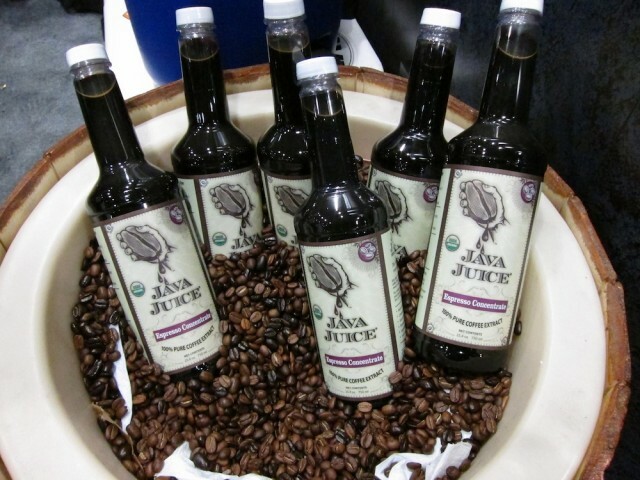 Java Juice can be used to instantly produce coffee by mixing it with hot water, or as iced coffee by pouring it over ice. Mixed in equal parts with the vastly popular Rum Chada makes an easy and delicious coffee drink. Best “New” Products From The Show: Nightclub & Bar is often an important show for new product lanches, and one of the best new products on the show floor was Xi Acai, a product partly owned and developed by Survivor Philippines Star Abi-Maria Gomes. Xi is a lower proof (25% ABV) and low calorie mixer. It’s rum based but quite soft and easy on the palate; sweetened with agave, it is staggeringly low in calories (a two ounce pour is only 37 calories). Xi isn’t nearly as assertive or bitter as Leblon “Cedilla” Acai Liqueur, making it much more approachable. Xi combines some star power, great flavors, low calorie, and buzz worthy ingredients into a product that could absolutely explode. Another of the best new products at the show wasn’t a spirit product but an inventive way to help prevent intoxicated driving. 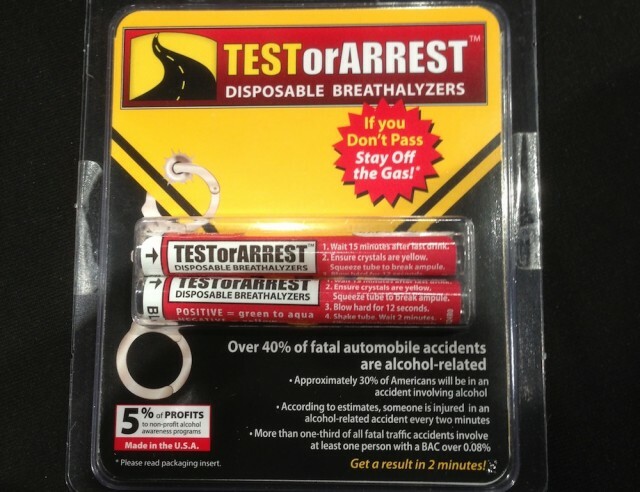 Test or Arrest is a product developed by Jeff Meadows, a DUI defense attorney who got frustrated watching so many of his clients get stopped just at or over the legal limit. Test or Arrest is a pocket sized, disposable breathalyzer which quickly tells you if you’ve had too much to drink or not. This is an important tool because with alcohol, the line between lightly buzzed and over the legal limit can be very small. Test or Arrest can easily be slipped into a pocket and discretely used. Priced at $9.99 for a two pack, it’s an extremely inexpensive way to avoid driving intoxicated and practice responsible drinking. 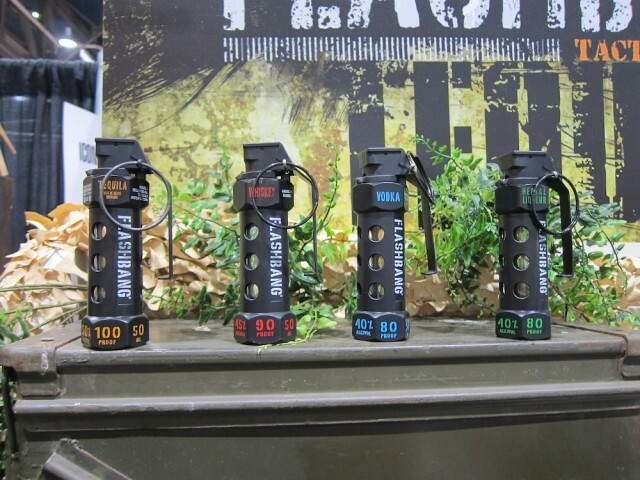 One of the most striking packages at the Nightclub & Bar Show came from Flashbang Tactical Drinking, a company that delivers single serving shots in flashbang replicas. The Flashbang packaging is not only inventive, but for $6.99 the reusable flash bang shot glass is unique, fun, and reusable (just don’t try to bring it in your carry-on baggage when you fly). Flashbang debuted with a 100 proof tequila which is, as you’d think, hot and strong. They’re developing other flashbangs with vodka, whiskey, and a Jager-like herbal liqueur. One of the really nice things about Flashbang is that they donate a portion of every sale to Operation Gratitude which supports America’s troops. 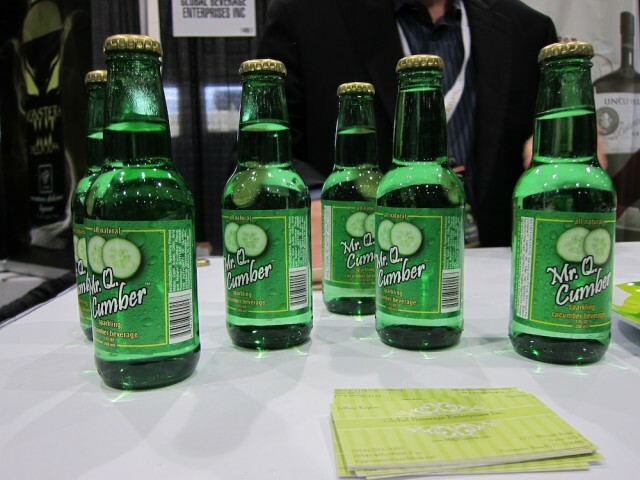 By far, the best product at the 2013 Nightclub & Bar Show was Mr. Q Cumber, an absolutely perfect cucumber soft drink. Cucumber can be an awfully tricky element. With over 700 different varieties of cucumber, it’s difficult to get a consistent and non bitter cucumber note. Mr. Q Cumber has captured one of the most delightful cucumber flavors we’ve ever had. It’s balanced perfectly with the sweet elements and carbonation into a drink that couldn’t be more ideal to mix with gin, especially Hendricks. There were many big brands at the Nightclub & Bar Show, but the most fun of them was Pernod Ricard and their promotion for Kahlua Midnight. 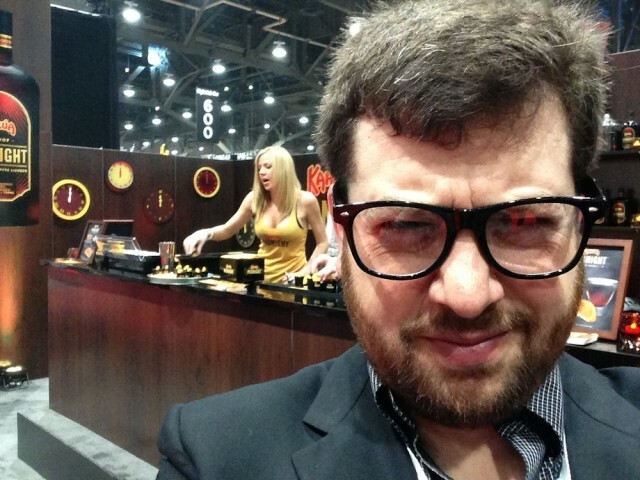 Attractive women handed out non-perscription black rimmed glasses and poured shots of Kahlua Midnight through an ice luge. It was a strong positioning of a long standing and somewhat aging brand as something fresh, hip, and cool. The Kahlua Midnight booth left us with the strongest impression of the show and was by far the most fun. 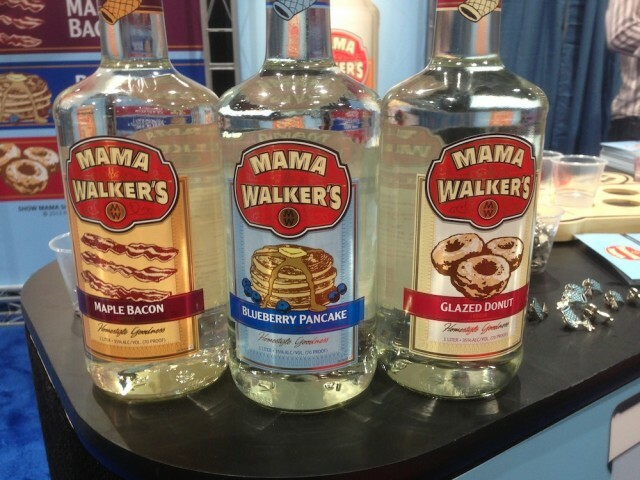 One of the worst products from the 2013 Nightclub & Bar Show was Mama Walker’s breakfast flavored liqueurs. With flavored vodka exploding, it’s no surprise to see unique flavored spirits like Mama Walker’s Blueberry Pancakes, but the problem is that this line isn’t vodka – they are liqueurs. 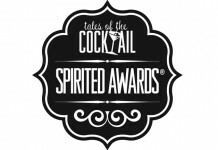 The result is spirits so sickeningly sweet that they are extremely difficult to enjoy. Mama Walker’s Glazed Donut was the only one of the three that really delivered on the flavor promise. Blueberry pancake and maple bacon were both so sweet that the underlining flavors didn’t really shine through. Mama Walker’s is perhaps proof that there are real limits to the flavored spirit space and that the trend may finally be coming close to having run its course. 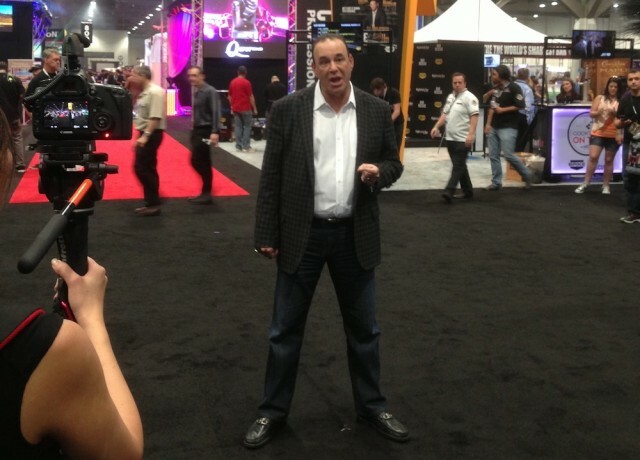 Perhaps the biggest winner of the 2013 Nightclub & Bar Show was Jon Taffer. After a couple of years of contracting during the recession, it was clear that the Nightclub & Bar Show is back in a big way. The show floor had more vendors with more variety. The conference had more sessions that were strongly attended, many of which were standing room only. Even more palpable was a clear increase in Jon Taffer’s fame. His show, Bar Rescue, clearly is reaching a wider audience and that resulted in a big boost all the way around for the show.